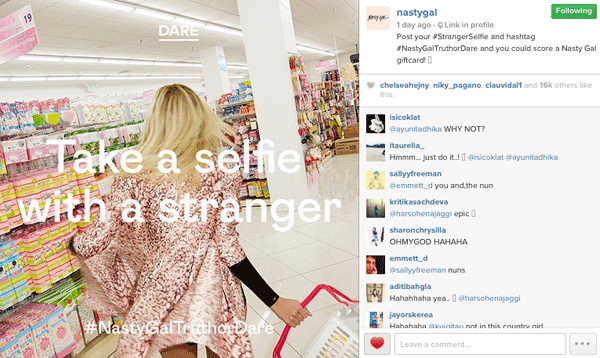 Have you looked into whether it’d be a good idea for your business to advertise on Instagram? A few weeks ago I saw my first “sponsored” post in my Instagram feed. Actually, let me rephrase: I noticed my first “sponsored” post in my Instagram feed. It got me thinking. Instagram ads look like normal posts, the only differences are they have the blue “sponsored” tag and they come from an account you don’t necessarily already follow. 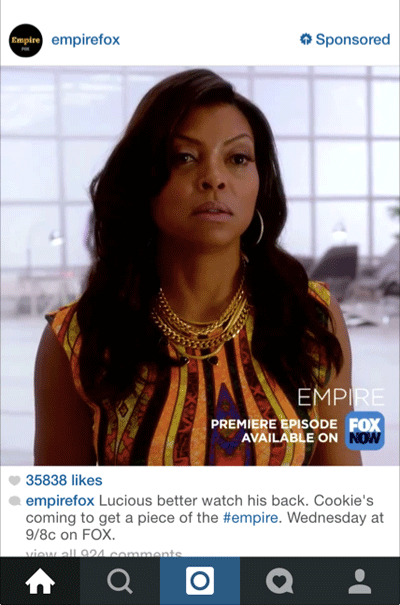 The ad I saw was from “empirefox,” which is an account dedicated to promoting Fox’s new show Empire. Obviously Fox is a major brand with bookoo bucks. So what about small to medium-sized businesses? Can they advertise on Instagram despite not having hefty advertising budgets? Yes. More on that later, but first, how much does it really cost to advertise on Instagram? I wish I had the scoop…..
One response to this question I found, was on Quora. Just like when you land on a business’s website and it says “call us for pricing,” often a deliberate lack of information is enough to warn you that their product or service is expensive. Same thing goes here. Instagram’s being quiet and choosy about their first advertisers so you know it’s costing those they have been exclusively invited to advertise with them a pretty penny. Just because Instagram doesn’t currently offer small to medium-sized businesses the opportunity to advertise on their platform through their app, it doesn’t mean modest-sized companies are S.O.L. There are other options available, you just have to be a little creative and willing to think outside the “traditional advertising” box. Here are four ways you can use advertising and other paid media efforts on Instagram. Hosting a giveaway, whether it’s a partnered or solo-branded giveaway, is a popular option for businesses that want invest some money into creating awareness for their brand on Instagram. Instagram, at least when compared to Facebook, does not have very many promotion rules. In fact, the only rules businesses have to abide by are to, 1.) acknowledge (in the giveaway post’s caption copy) that the business’s promotion is in no way sponsored, endorsed or administered by, or associated with, Instagram, and 2.) not inaccurately tag content or encourage users to inaccurately tag content. This means businesses can get really creative with their Instagram giveaway concepts and rules. Contests that tend to drive the most awareness are ones that require users to tag a friend in the post’s comment section to enter. Contests that require entrants to post a photo or video on their personal Instagram profile that mentions and/or tags the business and/or their contest hashtag in their post’s caption copy usually get great exposure also. If you need tips on how to host a photo contest on Instagram, look no further than Instagram’s blog. Here’s an article from them that shares some good tips. Social Media Examiner also has a good post on this topic. An Instagram account takeover is when a brand invites (and often compensates) a guest instagrammer to post on their account for a period of time, often for 1-3 days. A guest instagrammer is usually someone who is popular, i.e. has a large Instagram following. There are many benefits to having an Instagram takeover. One of the most valuable benefits is having your business’s account introduced to a unique group of followers who likely have similar interests and tastes as the person you’ve invited to takeover your account. This often leads to an increase in followers, post likes and clicks on your bio’s URL. When an Instagram takeover happens, the influencer will usually post on their own account letting their followers know that on they’re taking over a brand’s account. 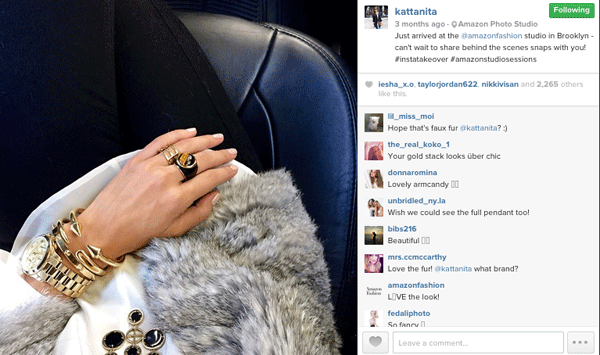 Here’s an example post of when NYC-based fashion blogger Kat Tanita took over Amazon Fashion’s Instagram account a few months ago. 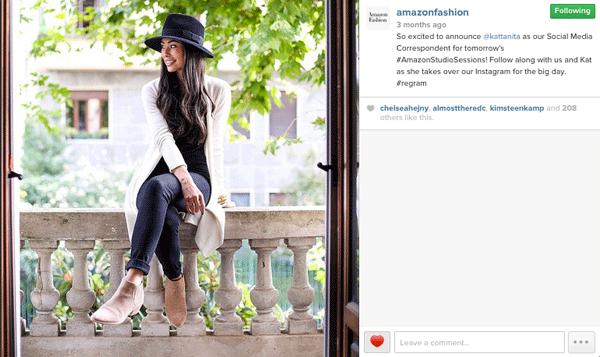 And here’s the post Amazon Fashion posted to announce the takeover. In a post titled, “What Spending $57,000 on Instagram Taught Me,” Neil Patel describes how, in addition to hosting a series of big-prize giveaways, he paid models on Instagram to shoot themselves with his prizes and give away some of them on their profiles. Neil discovered that every time a model posted about his Instagram account, roughly .2% of the model’s followers started following his account. He liked this result so much that he started paying more models and lifestyle accounts to post about his account — this is how he got 143,000 plus followers. Neil’s practice of paying influencers, i.e. accounts with massive followings, can work for your business too if you align yourself with the right type of accounts. Meaning, if you have a health product, team up with fitness gurus on Instagram. Or if you’re a trendy agenda book company, team up with a female fashion and/or lifestyle blogger who shares your same aesthetic. If your business is planning to partner with an influencer in either a small or large capacity — it could be to help you announce a new product or promote your giveaway — it’s advantageous to include posting stipulations in your contract with your partner(s). For instance, both parties can agree on a number of brand-related Instagram posts within a specific period of time. You can also specify in your contract that your influencer(s) must use specific calls to action and tag or mention your brand’s Instagram account in their posts’ caption copy. In a FastCo.Design article, this topic of Instagram posting agreements is mentioned when explaining how Chiara Ferragni, a style blogger who now has more than 3 million Instagram followers, makes her money. The beauty of Instagram is that it’s a creative platform. That said, if your business is looking to have an impact with its community, it’s important to follow the app’s lead and be creative. And not just with your posts, but in all respects of the platform, including advertising.